John Timpane, who edited my first Philadelphia Inquirer piece back in 1999, offers an interesting piece in the Inquirer about the anniversary of the Battle of Bladensburg. Was it a brave, last-ditch effort to defend the country? Or a humiliating military disaster, with U.S. forces taking to their heels before the bloody British? Sunday is the 200th anniversary of the Battle of Bladensburg, down in Maryland, in which an overwhelmingly volunteer American force stood between Washington and the most powerful army in the world. We lost, of course. And that same day, the young capital in the miasmal swamp went up in flames. Thus, the questions about one of the more puzzling battles in our history. A pretty puzzling war, that War of 1812. Not that well-known. Maybe because, face it, it's one we didn't win. 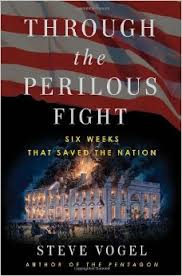 Note: I happen to being reading Steve Vogel's Through the Perilous Fight: Six Weeks That Saved The Nation, which covers the War of 1812 and how Francis Scott Key wrote what would become our National Anthem, The Star-Spangled Banner. This interesting book also offers a detailed account of the Battle of Bladensburg. The battle was not our finest hour, but we later stopped the British from taking Baltimore and we went on to win the Battle of New Orleans.